The electro submersible PX series is designed for drainage and lifting clear or slightly soiled water even in the absence of power from the mains. Submersible pumps equipped with a continuous current motor (CC), can be fed to battery ensuring operation even in the absence of electric current and in emergency situations. The voltage of these electro pumps is 12 or 24 volts. The batteries autonomy in the operation of the pump 2 hours at full capacity. A dedicated control panel of the submersible pump with automatic charger ensures efficiency. The PX submersible electropumps are great for lifting water from flooded rooms like basements and underground areas of villas, residential complexes, apartment buildings and in all the applications that can not take advantage of the normal power supply. 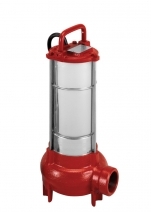 The D.C. electric submersible pumps at 12 and 24 Volts are suitable for the lifting of dirty water. Driven by normal batteries they are particularly used for the lifting of water from road drain wells, basements and from sites where the electric current is not available. Connected to an electric panel, with automatic battery charger, the pumps are used in fixed installations for draining basements of villas and block of flats.